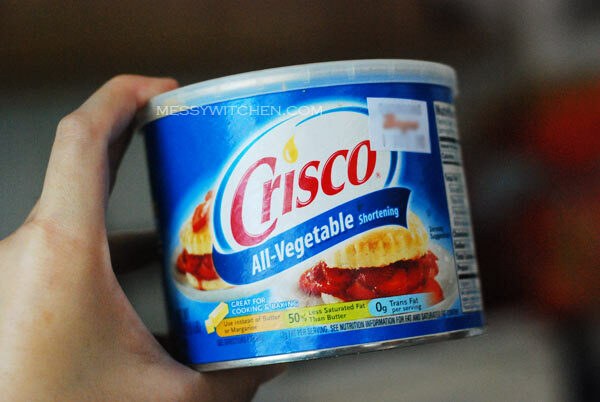 The shortening that I used; transfat-free. Note: I highly suggest using butter instead of shortening. Notice the kinda less bright red-orange yolk at the bottom? This one is turning no good. I used it anyway since it doesn’t smell rotten. Add mashed salted egg yolk and sifted dry ingredients to the wet mixture. Notice how chunky it becomes? Just use your hand to bring the dough together. Don’t mash the salted egg yolk too fine or you won’t be able to taste the salted egg yolk (still the flavour is there). Rolling out the dough is really easy. 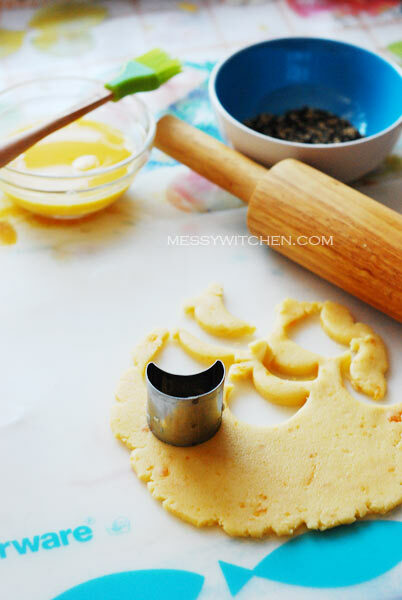 When cutting the cookie, I use the cut-and-scoop method so that the cookie will cling inside the cutter. This way I can easily transfer to the baking pan without deforming its shape because it’s too soft to cut and then pick up from the table. They’re ready for the oven! Note: Cookies are fragile when fresh hot out of the oven. Handle them with care and with love because they are gems! My only wish is that I didn’t mash the salted egg yolk that fine. Maybe I’ll add an extra egg next round. Do try this super unique cookie. I’m sure you would love it as much as I do. 1. Sift flour, cornflour, baking powder, baking soda and milk powder. Set it aside. 2. 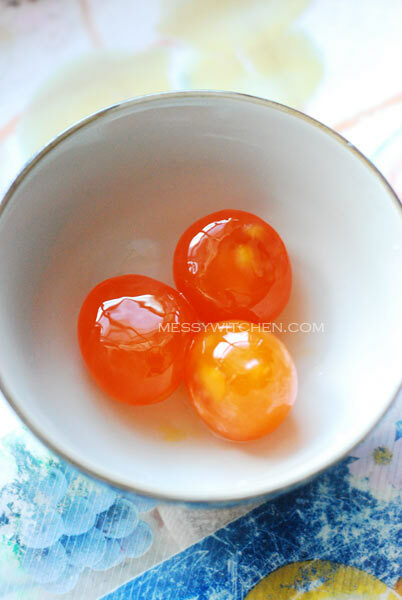 Steam salted egg yolks for around 8 minutes in a steamer. Mash with fork and set it aside. 3. 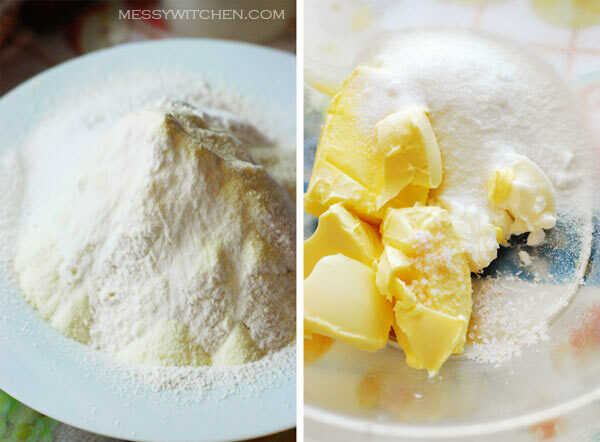 In the mixer bowl, add butter, shortening, salt and sugar. Mix until sugar is dissolved. 5. Preheat oven to 175oC. Line the baking pans. 6. Roll dough to about 5mm thickness and shape with cookie cutters. 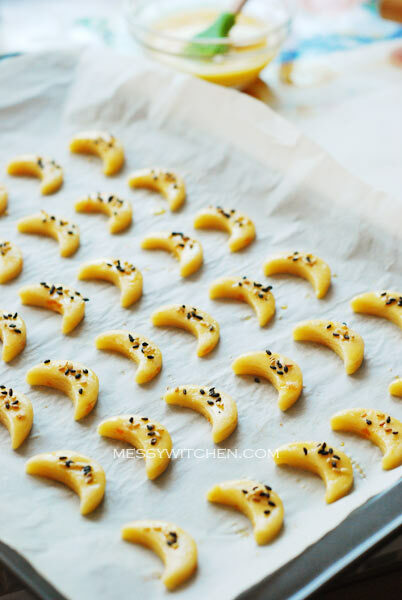 Brush with egg wash and sprinkle with sesame seeds. 7. Bake for 20 minutes or until golden brown. Remove and cool on cooling rack. Store in airtight containers. (perfect baking time for my oven is 18 minutes). Just a month plus away. Wohooo! Yeah this cookie is very unique. I can smell the scent of Chinese New Year in the air now! Hi Jessy, same here… need to wait patiently for the best time. 🙂 I plan to make them (my 2nd time) 2 weeks before CNY. Do you have to steam the salted egg yolk before smash it?? Am a bit confuse down here. Sorry for the confusing bit. I didn’t mention in the post photo but it’s there in the recipe. Looks and sounds good! 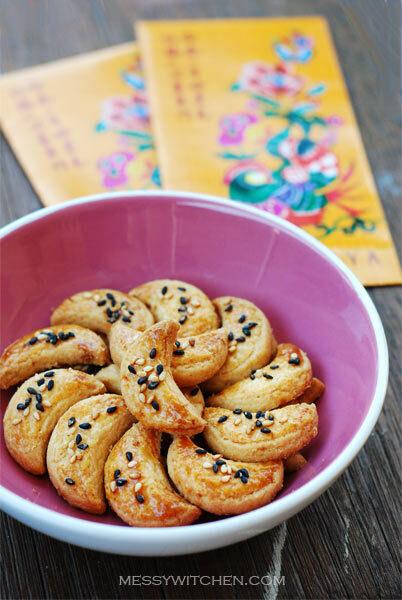 Would love to make these for CNY this year. How long can I keep these cookies for in an airtight container? 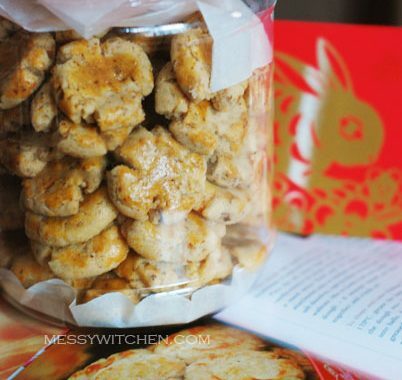 Anyway I plan to make them again for CNY about 2 weeks prior to chor yat. If you’re worry, you can make 1 week before CNY. Once, big thanks again for this great recipe. Now 2 more of your great recipes added to my list. A happy new year to u.
Hahaha guess you have to make more! I try making it and it taste great! Gonna make more for CNY! Thanks for the great recipe! Hi Ann, thanks for dropping by. Hope you’ll like it. Cheers! and I put in 5 salted egg yolks….. 😛 OD. Hi there, I’m so happy you and your kids like them. I use extra egg yolks during the latest CNY cookies making but found they’re quite similar in taste with the original recipe. Maybe just a little saltier. Cheers! Hi Che-Cheh, would like to ask U for the peanut cookies is it the same as green pea recipe? 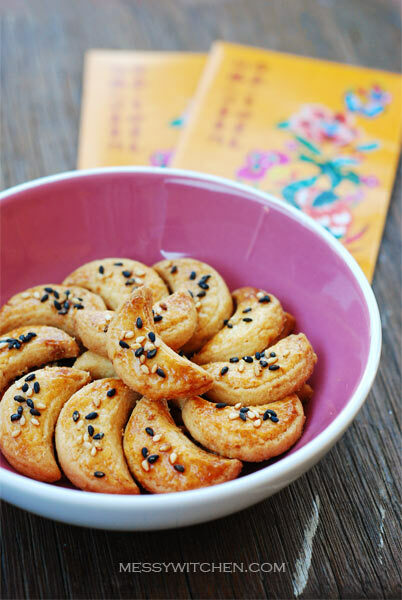 I would like to try baking cny cookies for the coming cny. Thanks! 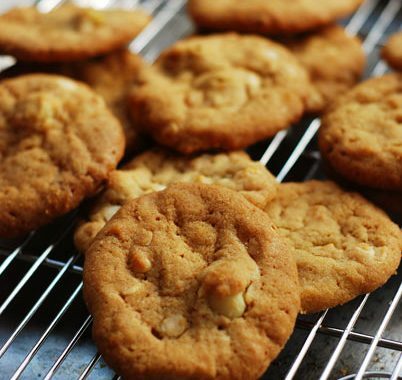 Hi Christie, I’ve not bake peanut cookies before so I don’t know whether it’s the same. My guess is it’s not the same. Is it possible for me to omit the milk powder? Hi Xuan, I think you can omit the milk powder. hihi, may i check with u, the butter is unsalted or salted? thanks.. I use unsalted butter. If you use salted butter, then don’t add salt. Hi there, where can we get salted egg yolk (just the yolk)? Hi Kyupi, I don’t think so you can buy just the yolk. 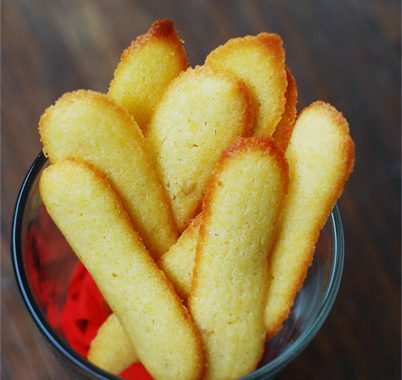 Hi messywitchen, may i check with you that how long can i kept this salted egg yolk cookies? Thanks for the recipe. I tried it out today and it taste wonderful. I love the sweet savoury taste and that’s my favourite shape! Thanks again. Hi Novice Baker, I’ve kept them in air-tight containers for as long as 3 weeks. It’s not because it went bad after that. It’s because we ate all the cookies. 🙂 I think it’ll be too salty to add the egg white. You can try, no harm but I won’t guarantee how it would taste like. I’m not sure if you’re Asian, but we use the egg whites (steamed) and eat with plain porridge and other side dishes. Hi thanks for the reply. One last qn: can I replace the all purpose flour with self raising and omit the baking soda + powder? Hi Novice Baker, Hmm… if according to common sense seems like it would work. But I’m not sure if the end result (texture) will be the same. Tsk you need to omit salt too if you’re using self rising flour. Self rising flour contains baking powder and salt. Hi, just wanted to confirm that the salted egg is in RAW form before we steam right? Not the cooked ones. Thank you. Hi Lydia, yup use raw salted egg before steaming. Thanks for the great rccipe!! So GOOOOD!!! Hi Sandrine, you’re most welcome. Glad I could share. I’m planning to make the cookies tomorrow and I was wondering if I could just roll them into little balls and press them down with a fork to flatten them, instead of rolling out and using a cookie cutter. Yes, you can. The baking time may be different ya due to its thickness. So adjust accordingly. The salted egg yolk cookies were light, crisp and had the most wonderful melt in the mouth texture. The only slight changes I had to make for the ingredients was replacing the milk powder with powdered creamer that I had on hand (it would be such a waste to buy a whole packet of mik powder just to use a tablespoon), and I added one extra salted egg yolk as I absolutely love it! Hi Gina, So happy the cookies turned out super lovely. I made a batch recently and I think I ate most of it. Opps! I’m been baking this recipe for the past few years. Do you think I substitute the salted egg yolk with salted egg yolk powder? Hi Emmeline, I’m sure you can use salted egg yolk powder. Not sure of the quantity though. You would have to experiment. Hi Cindee, yes you can omit the milk powder.